The Carriage Museum includes eight renovated galleries that tell the story of transportation before the automobile. 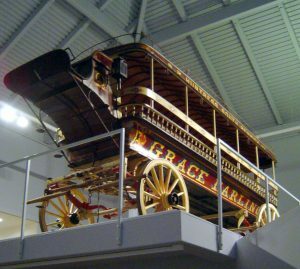 Grace Darling, a huge, beautifully decorated omnibus, welcomes visitors as they enter the building. The Going Places Gallery features vehicles commonly used on Long Island, along with a huge fiber-optic map illustrating the development of regional transportation routes. The Carriage Exposition Gallery, based on the 1893 World’s Fair transportation building, highlights the finest vehicles money could buy, and the carriage-making companies that created them. Making Carriages: From Hometown Shop to Factory features the museum’s collection of vehicles factory-built by the Studebaker Brothers, alongside the Graves Brothers Carriage Shop, a real 19th century shop reassembled from its original home in Williamsburg, Massachusetts. The most recent installations are the Streets of New York and Driving for Sport and Pleasure galleries. Visitors will marvel at the scenes depicting life in 19th century New York City, including a “burning” building, and commercial vehicles on bustling city streets. The central attraction in Driving for Sport and Pleasure is the recently acquired Tally-Ho, a magnificent English coach that started the pleasure driving craze in the United States. Interactive audio displays accompany the new galleries. Learn about the Tally-Ho Project. Finally, visit the Gentleman’s Coach House Gallery, inspired by the 19th century Gold Coast carriage houses that graced Long Island’s North Shore mansions, and the European Vehicles Gallery, showcasing rare, royal carriages used by European nobility.